Day 9 – Hannibal to Dayton, Ohio – EHFC Members Talking! Today’s flying was probably the best of the trip. The weather was forecast to be fine for the 330 mile trip, and it was. For once, I could fly just the route I’d decided on the night before. We got out of Hannibal around 9:00AM. No pictures of the Mississippi, sorry. 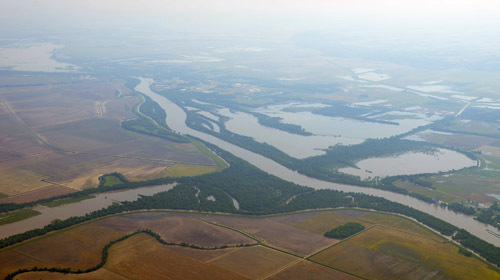 We crossed the river while I was too busy climbing out of the airport – it’s only a few miles east. We crossed the border into Illinois at the middle of the river. The weather was calm and the sky clear, but there was a haze layer going up to about 4,500 feet. I decided to climb above it, and by 5,500 feet we were on top. Above the haze it was clear, cool and beautiful, and the air couldn’t have been smoother. Southern Illinois is farming country, but unlike the dry farms of Texas and Oklahoma I’d passed through a week or so ago, here the rivers are high and the fields are flooded. 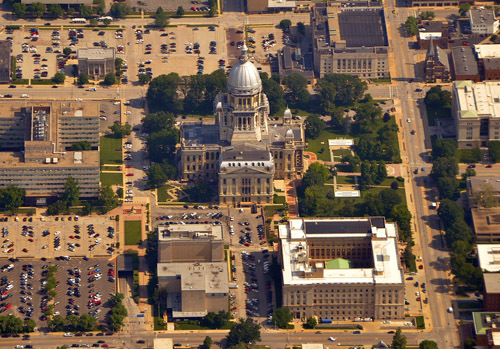 We flew south of Springfield, and I grabbed a shot of the dome of the State Capitol building as we passed. 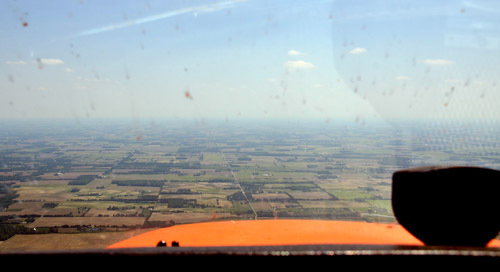 Frankly, most of Illinois and Indiana, when we got there, are basically boring to fly over. 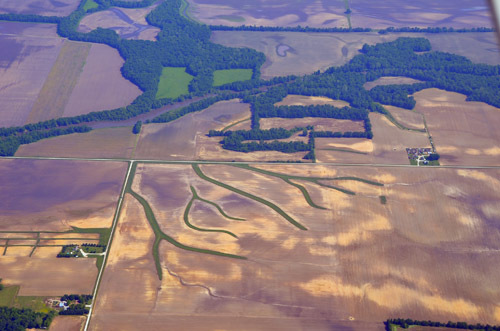 Just flat land and farm fields as far as the eye can see, split into neat one-mile squares, stretching to the horizon. Sometimes there were some interesting patterns, though. The haze layer we’d been on top of at 5,500 feet started to thicken and turn into clouds, so I descended to 3,500 to get under them. 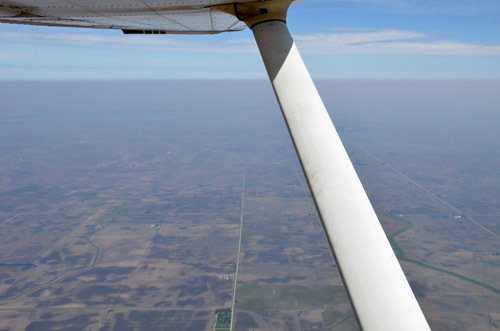 Of course, as soon as I did that the clouds dissipated, the haze cleared, and it became a really clear day (by Eastern standards – Jerry was noting how poor the visibility was by Colorado standards – you couldn’t see more than about 20 miles…). 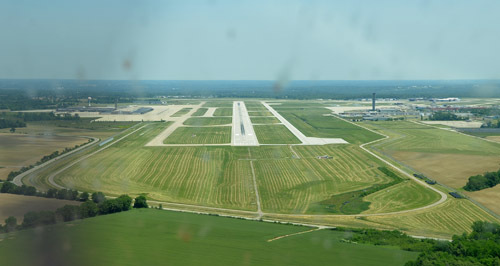 I had been a bit undecided about flying into Dayton International (KDAY), as opposed to one of the outlying airports, just because of the size of it. It’s got parallel runways 6/24 Left and Right, and huge ramps… it seemed a bit intimidating. 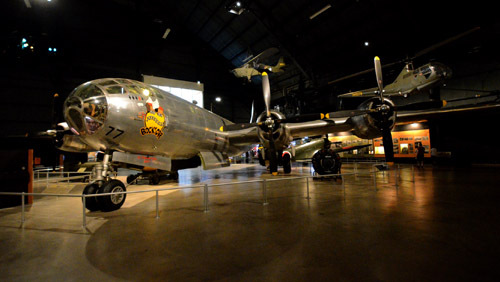 Still, it was just a class C, like Syracuse or Islip, and I’ve flown into them many times, and it was by far the most convenient to the Air Force Museum. So, I decided to give it a try. As it turned out, it was easy. 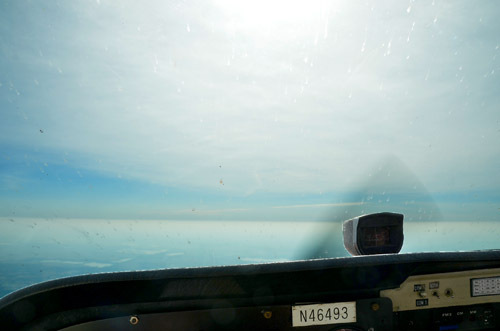 The controllers were easy to deal with – we picked up Columbus Approach about sixty miles out, and were with them until they turned us over to Dayton Tower at about 15 miles from the field. We were cleared to land on runway 6 Left while we were still ten miles out, and in the end it’s just a runway – all right, about twice the length of 14/32 at Ithaca, but the same width. The biggest difference is how far you have to taxi after you land. As it turned out, Dayton International is physically huge but not very busy, after the airlines which used it as a hub folded. 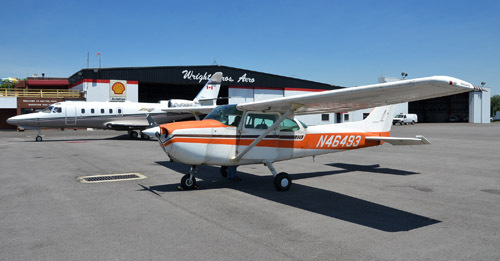 After a few miles taxiing, we arrived at the Wright Brothers Aero FBO – nice to see they found something to do with themselves after inventing the airplane. I don’t know if it was Orville or Wilbur who met us and waved us into a parking spot outside their hangar, but in any case we were soon set. They were really nice about arranging a rental car when I called before we left Hannibal, and it was waiting for us as we taxied in. Less than half an hour later, we were at the Air Force Museum, and that’s how we spent the rest of the day. We’re 383 miles from Ithaca as the crow (and, hopefully, Cessna 172) flies, so tomorrow should get us home if the weather cooperates. We’ll see.